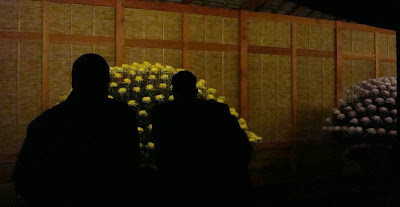 Last night, James, Jonathan and I went to the Bronx Botanical Gardens for a special evening of chrysanthemum-viewing and Japanese-drumming-listening. 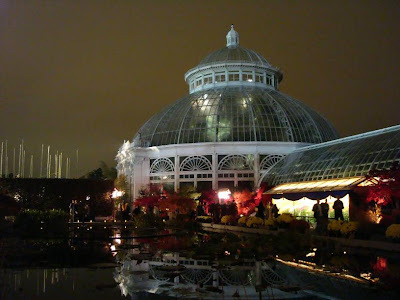 I'd never been to the Garden after dark, and it was a perfect evening, with the haze of the city lights and the overcast sky producing a dome over the dome of the Haupt Conservatory. 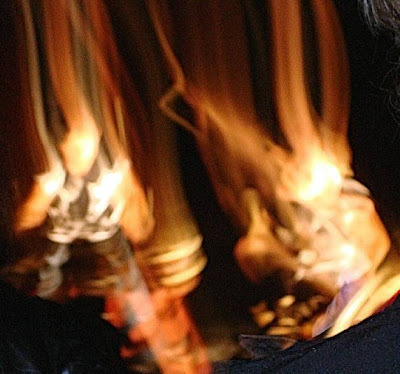 People wandered the courtyards with classes of sake and beer, in awe of the splendid and devoted craft of the kiku artist, who works for weeks to produce an array of perfect blossoms in varying forms. A number of different types of display were on view, from cascading waterfalls of blooms coming from a single carefully pruned plant, to the stately stand of a dozen or so heavy-headed blossoms tall and erect at an absurd height, to the mountains of hundreds of blooms on a pillow-domed framework. Then there were the exciting rhythms of the small taiko drumming ensemble, with flutist, working to a fiery pitch in the light drizzle. An altogether unforgettable evening. Kikumi ga tanoshikatta sō desu ne!